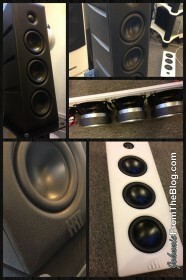 JohnnieFromTheBlog – Part 2: HRT Stage, a compact audio system with high-end capabilities? Earlier this year I auditioned a brand new compact audio system from HRT called Stage. Back then it wasn’t even released yet, and the system I auditioned was only a production prototype. HRT has been everything but modest in the marketing of Stage, and claim that people have compared the performance of Stage equal to systems in the $20.000 USD segment. But when I auditioned the production prototype it barley passed as a $100 USD computer speaker system. Seven months has gone by since then, and now HRT Stage is in the production line and has been released to the stores. Once again I was invited by the Swedish HRT concessionaire for a private demo in their hotel suite during the recent hi-fi exhibit (HiFi Mässan 2013). The visual design is still the same, simple but futuristic looking. The whole system is a 3 piece kit, a pair of speakers and the main unit, and comes in either white or black. The speakers doesn’t come with any front grills and the drivers are visible at all times. Many people might not like that, but personally I think it looks very good. The main unit (The amplifier and control unit) is an awkward, nonstandard measurements cube which might be hard to fit into a stereo rack or a media bench since it really doesn’t match anything else. The main unit contains everything needed to run the system; DAC, Pre-amp and a 2×70 watt power amplifier. The main unit can also later be upgraded with a wireless streaming module. Both the main unit and the speaker cabinets are made of plastic, but even so, the build quality feels sturdy. HRT themselves tell us that they have chosen this type of plastic because of its properties. The two speakers are each equipped with three units of 3-inch long throw bass drivers and a single 1-inch textile dome tweeter. The system is specified to play in the frequency range 45-20000Hz +/-3dB. Even though the bass drivers are only 3-inch drivers they pack a lot of punch, and as you can tell by the above photo, they have a huge magnet structure. HRT’s hotel suite was a great listening room! Standard size, perhaps 200 square feet (18m2), ordinary 3 seat couch and more or less nothing on the walls. It resembled of my own listening room at home. We played through some of the same songs that I had played last time I auditioned Stage (See my previous post for play lists), but also a few new. It didn’t take many minutes to hear that this time it was a completely different system playing compared to the prototype. Not even in the same league. The sound stage is huge and convincing, right there in-your-face, which I personally like. The highs is a bit softer and more forgiving compared to what I usually prefer, but very crisp and easy to like. The system packs quite an amazing punch in the mid bass considering its small size, but doesn’t produce much deep bass, obviously. But hopefully, nobody who choose a compact audio system with small stand-mount speakers expect them to rumble the room with deep bass. The whole sound character is open and clear with a somewhat smooth sound that suits well as an all-round system. Whatever changes HRT did from the prototype to the final product, they did it right! While we were playing songs on the system, I was asked if I think I can get a better system for the same money? I said I am convinced that you can get the same or even better for the same money if you go out and hand-pick components yourself, but then you need to know exactly what you are doing and go through all the hassle of matching and searching for components yourself. So as a complete system for €1100 Euro, ready to use out of the box with cables and all, I must say that HRT Stage is a hard to beat system in it’s class. It’s compact, easy to use, upgradeable and relatively cheap. HRT has also announced that they soon will be releasing a matching bass module for Stage. And when they do, I believe this will be a very competent system which will attract a wide customer base. I am hoping to get my hands onto the bass modules very soon to make a review about them. Until then, peace!